I’ve heard a lot of rumors about Spotlight now actually ‘working’ in Leopard. That’s good news, because it was a total bust in Tiger. I liked the idea of it, but it was just too damn slow to actually be useful and I ended up using Quicksilver instead. In More Goodies in Appleâ€™s New Operating System, David Pouge mentions two new features in Spotlight (other than fixing the molasses problem) I wasn’t aware of. [Spotlight] is also a tiny pocket calculator now. Hit Command-Space, type or paste 38*48.2-7+55, and marvel at the first result in the Spotlight menu: 1879.6. You don’t even have to fire up the Calculator. This is a neat idea, and if I could train myself to actually use it, it would be useful. The Spotlight menu also searches the Leopard dictionary now. 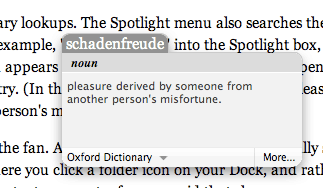 If you type, for example, “schadenfreude” into the Spotlight box, the beginning of the actual definition appears right there in the menu. Click it to open Dictionary and read the full-blown entry. Um, interesting example word. Anyway, one of my favorite features in OS X is the ability to move your mouse cursor over any word (in a Cocoa app) and press Ctrl + Cmd + D and get a little pop up that defines the word. I’ve been steadily beefing up my vocabulary by using this feature. Sometimes this little trick isn’t enough though and I have to go to the real dictionary. I usually use Dashboard for this, but in general I’m really not a fan of it. This new Spotlight trick is great.